I fried up my first mess of mushrooms of the year last night. I took a few pics and thought I would share how I do it. Nothing too fancy. The “secret” to my recipe is using a saltine crumb based breading. I am interested in how everyone else does theirs. 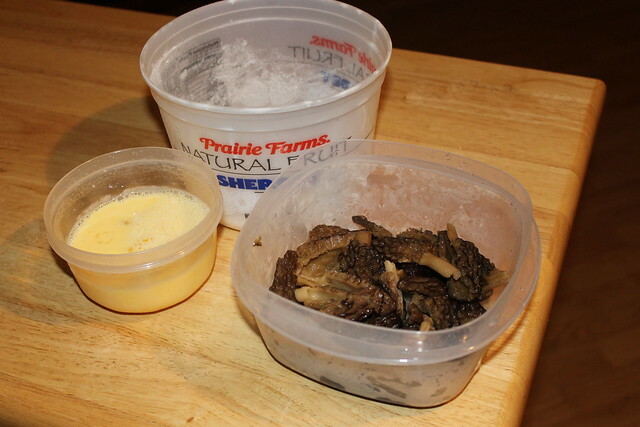 -The mushrooms are cut in half and rinsed off then soaked in salt water at least 12 hrs. 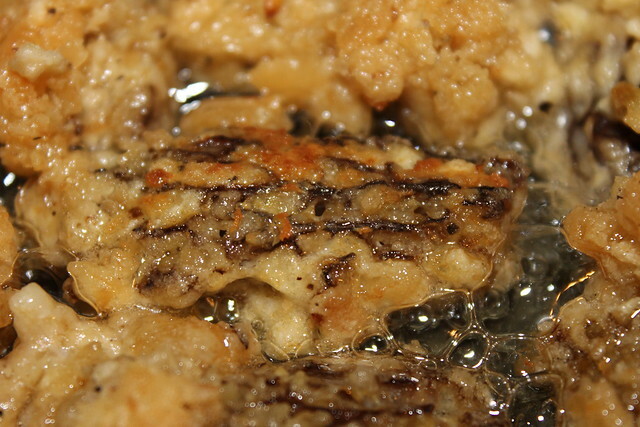 -Heat up a frying pan with about 1/8 - 1/4” of vegetable oil in it. I get it pretty hot. -In one bowl I mix 50:50 eggs and milk. -In another bowl I mix 70:30 Saltine Cracker Crumbs and Flour. I then add spices to this bowl. I experiment here. Usually heavy on the pepper. Last night I used Montreal Steak seasoning. -Rinse each mushroom off as you pull it out of the soaking bowl. Thoroughly coat them in the egg/milk mix, then thoroughly coat with the cracker crumb/flower mix. -Place in the hot oil. Do not flip until completely cooked on the bottom. Fry to desired shade. Man do those look delicious!!! I pretty much do the same.Dip in egg/milk and then shake them in a bag of saltine cracker crumbs…no flour.Then fry them in buttered flavor crisco in the fry daddy. Season with alittle salt,sometimes a dip in ranch dressing. About the only difference is that I like to add a little cayenne to the cracker crumbs and I fry mine in peanut oil. That picture makes my mouth water. Im going to look this weekend in Knox County. Hope they’re up. They sure do look good, mess of crappie or gill fillets next to them would have been good. After soaking mine I put them in a strainer for awhile in the fridge to let the extra water drip off and to firm them up a little after the soaking. Milk and egg, cracker crum and flour and seasoning, black and white pepper, seasoning salt and maybe a little onion and garlic powder sometimes. Every once in a while I will some throw in some of that 3 cheese breading you can get at the store. I want to try some of that Andy’s Veggie breading sometime on them also. I have also have took some chopped onions and peppers, brown them in butter in a skillet, then add morels and eggs, scrambled. Or put them in foil with butter and seasoning and cook them on the grill, and on the side either have some deer steaks or a big thick rib-eye. There not to shabby on a pizza either, just keep it simple with only the sauce, cheese & mushrooms. Used to take them to our local pizza place and the gal that made the pizza’s was my neighbor and did this for me. They were pretty good in a colzone (hope that’s spelled right) with italian sausage. Wonder what they would be like grilled up with some Dove breasts? 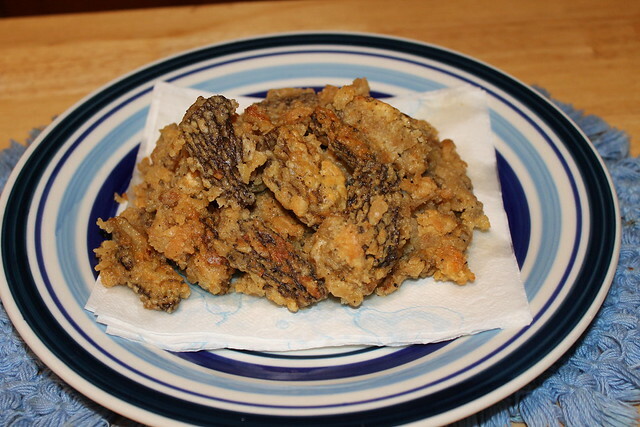 I keep it simple…Soak, rinse, shake in a baggy of Kentucky Kernal seasoned flour…Pan fry in butter if the wfe is not home…Deep fry in peanut or canola if she is..
to say i drooled is an under statement..i guess i better get the lead out and start huntin the morels! thanks for the ideas on how to cook them! eggwash, Club crackers, and butter! cant go wrong with that!!! Have heard of Ritz crackers being used. Just sitting here thinking how does this sound? Dove breasts or deer tenderloin, cut to desired length, morels halved with fresh asparugus, wrapped in bacon and grilled, or even marinate the meat in some home made apple or peach wine then do this? No matter what I always fry plenty up, but there are those good years when you do find plenty to cook different ways. I think the recipe Matt Cheever had for Blue Gill Fettuicinni would be good with Morels instead of Portabellos also. And yes on good years I always freeze some to fry later. When it comes to eating I just like thinking outside the box a little and you wouldn’t even have to use very many to do some of this.